Dry needling involves inserting acupuncture needles into the muscle to release the taut bands in the muscle. It is also known as intramuscular stimulation (IMS) or myofascial acupuncture. Between 770 and 476 BC, the first book was written on myofascial trigger points or “Ah-Shi” points, meaning “ouch” points. In the 1940’s, Dr Travell introduced the term “myofascial trigger points” and supported the theory that pain could be relieved with a needle without injecting anaesthetic or other pain relieving drugs. Hence the name “dry needling” was born. Various studies from the 1940’s till today have supported the theory of the benefits of dry needling. It is described by Travell and Simons in 1942 as pain related to a nodule or taut band in skeletal muscle or fascia. Pain can radiate in a distribution typical to where the muscle is located, thus showing the referral pattern of myofascial trigger points. It is usually described as very tender to touch/palpate, a deep dull ache, and can be associated with stiffness in the muscle and joint due to muscle shortening. There is actually a large overlap between acupuncture points and myofascial trigger points. In fact in a study in 2006, of the 255 trigger points located, 92% had corresponding anatomical acupuncture points. The main difference between acupuncture and dry needling is the needling technique, which will vary according to patient presentation and sensitivity to needling. 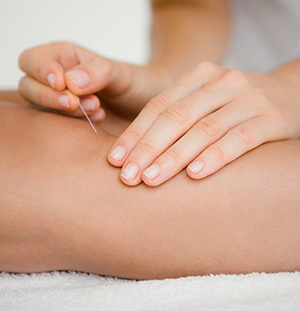 With acupuncture, the needles are usually inserted and left for approximately 20 minutes to get a treatment effect. When performing dry needling, there are two different techniques. The superficial technique involves placing the needle into the tissue directly over the trigger point or painful area, rotating the needle, then leaving it in for approximately 5-7 minutes. The direct deep dry needling technique involves inserting the needle around the myofascial trigger point, making a fan shape around the trigger point with the needle for up to 30 seconds. This latter technique aims to find the centre of the myofascial trigger point or taut band and elicit a local twitch response to release the tight muscle. A twitch response is an involuntary spinal cord reflex in which the muscle fibres in the taut band of a muscle contract.